The establishment of two new congregations—the first for “Laity-Family-Life,” the second for “Charity-Justice-Peace” that includes a new office for ecology—were among the proposals for reform of the Roman Curia that were presented to the College of Cardinals, on February 12, at the opening session of a two-day meeting in the Vatican. There is as yet no definitive reform plan, and the proposals mentioned are subject to modification but they could be implemented before the whole reform is decided. 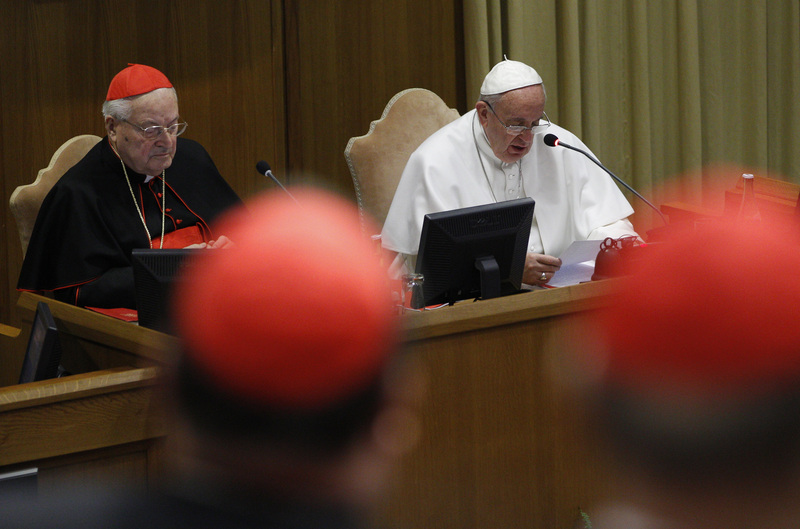 Pope Francis convened this "extraordinary consistory," as the meeting is called, to brief the cardinals on the ongoing work to reform the Roman Curia and to get their feedback. Some 165 of the 207 members of the college were present when he opened the meeting; among them the 20 new ones who will receive the red hat from the pontiff at a special ceremony in St Peter’s Basilica on February 14. More than 25 had indicated that they could not be present for reasons of health or age. Welcoming the pope in the name of the College of Cardinals, Cardinal Angelo Sodano, the dean, reminded his brothers that as cardinals they are called to collaborate with the Successor of Peter both as individuals and in a collegial way, as today. Recalling that the theme of this consistory is the reform of the Roman Curia, he said it followed earlier reforms made under Pius X in 1908, Paul Vl in 1967 and John Paul II in 1988. He called for their collaboration and, like at last October’s synod, he urged them to speak boldly, with courage and openness. He then gave the floor to the chairman of the Group of Nine Cardinal Advisors, Cardinal Oscar Rodriguez Maradiaga from Honduras. Most of the morning was devoted to the presentation from the cardinal and from the Italian Secretary of the G9, Bishop Marcello Semeraro. Since the cardinals are meeting behind closed doors, Federico Lombardi, S.J., the Director of the Vatican Press Office, who attended the consistory, briefed journalists on what happened at the morning’s session. What follows is, for the most part, based on what he told the media. The Honduran cardinal, Maradiaga, spoke first. He presented a summary of the history and work of the Group of Cardinal Advisors (originally 8 but now 9 since Francis added the Secretary of State, Cardinal Parolin to the group). “The G9” has met eight times so far, he said. He revealed that in the summer of 2013 Cardinal Bertello consulted the heads of all the Roman Curia offices and other Vatican personalities to get their input regarding proposals for the reform. Likewise, the other cardinal advisors had gathered or received input in their geographical regions, and more than 100 proposals had come from other sources. Various commissions had been set up by the Pope, and they gave their input too, most recently the Commission for Communications. The G8 had also received had specific inputs from the Secretariat of State, the Congregations and the Pontifical Councils. Francis raised questions during the meetings of the G9. Cardinal Maradiaga also revealed that Pope Francis has consulted the group of cardinal advisors on other issues too, including the synod of bishops. Bishop Semeraro, the Secretary of the G9, then presented a paper divided in two parts: the first on “The Inspiring Principles and Guidelines for the Reform of the Roman Curia.” He had presented a similar paper to the heads of the Roman Curia offices, November 2014, and today’s paper included input from that meeting. The second part of his presentation offered “the theological basis” and “ecclesial significance” for the creation of the two new congregations mentioned earlier. Presenting “the inspiring principles and guidelines” for the reform, he recalled that nature and function of the Roman Curia is “to assist the pope in his daily governance of the church” and be “an instrument of unity of the church itself” while respecting the autonomy of the diocesan bishops and the local churches, and helping them and the bishops conferences' in their mission. He highlighted the need for “a rationalization” and “simplification” of the organisms of the Roman Curia, on the basis of the fundamental distinction between "congregations"—which have "administrative power," and "councils"—whose task is that of study, promotion, giving pastoral advice in a given area, and tribunals which exercise judicial power. Semeraro spoke about the need to bring together or merge some of the councils, academies and commissions as is happening with the proposed two new congregations, and to reduce the number of existing bodies. He explained the need to “rationalize” the different competencies of the Secretariat of State, so that it can better serve as an “organ of coordination” of the various offices of the Roman Curia. He emphasized the need for greater “collaboration” between these different offices and stressed the importance of holding regular meetings of the heads of offices of the Roman Curia—working “in a synodal way.” The idea for a “Moderator of the Curia” as a separate figure was dismissed, he said, but not the function of which there is a real need; this task resides in the Secretariat of State. He also spoke about the need for proper and ongoing “formation” of all those working in the Roman Curia, whether clerics, religious or lay people, both in terms of spirituality and competence. Bishop Semeraro concluded this part of his talk by recalling that it had taken several years to finalize and approve the Constitution “Pastor Bonus” that instituted the reforms of the Roman Curia under John Paul II in 1988. He indicated that the present process would take time too. It is not yet clear, however, whether it will actually follow the same path, Fr. Lombardi said. In the second part of his presentation, Bishop Semeraro provided the cardinals with the theological underpinning and ecclesial significance of the proposed two new congregations. Addressing the proposal to create a Congregation for Laity-Family-Life, he recalled the emphasis given by the Second Vatican Council to the role of the laity in church and the world, and said that just as there are congregations for bishops, clergy and religious so too it is right and proper to have one for the laity. Furthermore, he said, the G9 believed it made sense to incorporate into this congregation both the Council for the Family and the Academy for Life, since both are so much part of the life of the lay faithful. In a similar vein, speaking about the proposed Congregation for Charity-Justice-Peace, the Italian secretary of the G9 reminded the cardinals that ‘charity’ has been fundamental in the life and mission of the church from its origins, while ‘justice’ and ‘peace’ are intimately linked to this too. He said the G9 is proposing that this new congregation incorporate other councils and bodies already operating in one or other aspects of this brief, namely: The Pontifical Councils for Justice and Peace, Cor Unum, the Pastoral Care of Health Workers, the Pastoral Care of Migrants and Itinerants. He said it’s also proposed to link the Academy for Social Sciences and Caritas Internationalis to this new Congregation. Bishop Semeraro also informed the College of Cardinals that it is proposed to create a new office within this new congregation which would focus on ecology and the care of creation (the environment and so on). That office will obviously take on a whole new importance when Pope Francis publishes his encyclical on ecology in June or July. Once the presentations ended, the cardinals immediately took the floor and will give their comments and suggestions today and tomorrow. Tomorrow, Cardinal George Pell, head of the Secretariat for the Economy, will present the reforms already achieved and those under way in the economic field. Cardinal Sean O'Malley will likewise brief the college on what has been already done, and the plans underway, for the Protection of Minors from abuse in the church.